Organisers of the New Zealand Open today announced that former US Open champion, Michael Campbell, will re-commence his career, following 3 years in retirement, at this year’s 100th NZ Open at Millbrook Resort and The Hills in February 2019. “The New Zealand Open is one of my favourite golfing tournaments. We are lucky to have an event of this calibre here in NZ – it brings top international talent to NZ and has helped me and many others progress our careers. I couldn’t miss being part of the 100th celebration,” says Campbell. Retired from competitive golf since 2015, his 50th birthday coincides with the week of celebratory events leading up to the 100th New Zealand Open. Achieving that milestone means he now qualifies for the PGA and European Senior Tours. His participation in the 100th New Zealand Open signals his first step back into the game he loves. One of only two Kiwi Professionals to have won a golf major, Campbell shot to fame when he beat Tiger Woods to win the 2005 US Open Championship. Campbell and the 100th New Zealand Open team are also thrilled to announce Manuka Doctor (a sponsor of Campbell) will join the list of major sponsors for the event. “To have a home-grown successful New Zealand company like Manuka Doctor come on board is a real vote of confidence in our event. We are absolutely delighted that they have elected to be a part of our 100th tournament celebration,” says Tournament Committee Chairman, John Hart. Manuka Doctor is a New Zealand company taking iconic Manuka honey to the international arena with genuine, authentic true-to-label Manuka honey and skincare products. Manuka honey has been dubbed a superfood so it seemed like a perfect pairing to help power the players at the New Zealand Open with natural energy of Manuka honey. 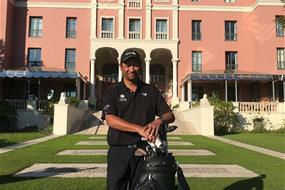 “We are thrilled Michael Campbell – one of New Zealand’s golfing elite – will be playing in the New Zealand Open. It’s great to be able to bring him home to play in such a premium golfing event being played out in picture perfect Queenstown. Together we are showcasing the very best of New Zealand to the world,” says Nicola MacFarlane, Manuka Doctor. With less than 100 days until the 100th New Zealand Open tees off in Queenstown, interest is running high as more and more international players and sponsors confirm their support. ”It is a thrill for us to have Michael Campbell return to play in New Zealand again and we are particularly grateful that, through our association with Manuka Doctor, we are able to add a former major winner of his calibre to our field,” says Mr Hart. The tournament is one of New Zealand’s leading sporting events with a long and prestigious history. The tournament was founded in 1907 and will be played for the 100th time in 2019. The tournament is a co-sanctioned event on the PGA Tour of Australasia and Asian Tour schedules.